Are you a fan of Churros, the sweet cinnamon Mexican treats? Then you’ll love these mini muffins! They are easy to mix up, and kids have fun dipping the warm muffins in melted butter and cinnamon sugar. 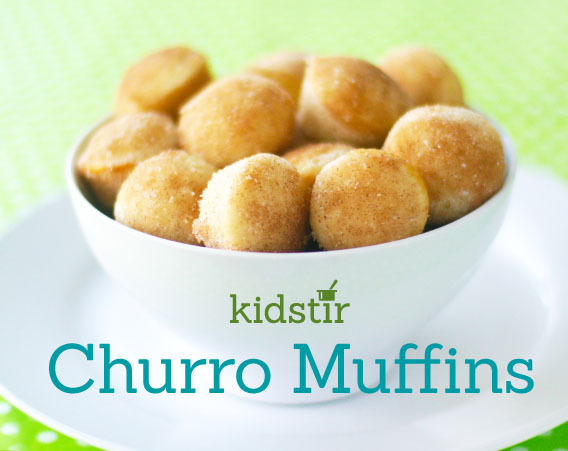 They are as tasty as the real Churros without all the mess of deep-frying. 1. Preheat the oven to 350°. Butter the cups of a mini (or regular) muffin pan. 2. Measure the flour, sugar, baking powder, salt, and nutmeg into a large mixing bowl and stir it all together. 3. Crack the egg into a separate bowl and whisk away. Mix in the milk, melted butter, and vanilla extract. Pour it over the flour mixture and stir until all the flour disappears. 4. Spoon the batter into the muffin cups, filling each about two-thirds full. 5. Bake the muffins for 15 minutes (bake regular size muffins for 20 minutes). Cool slightly. 6. Mix the sugar and cinnamon in a small bowl. Pour the melted butter into a separate bowl. Dip the warm muffins first in the melted butter and then in the cinnamon sugar.